SimpleFastCash launched in March of 2013 and was founded by Graham Frame, who operates out of Lincolnshire in the UK. 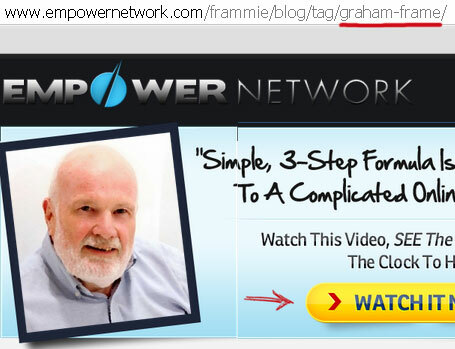 In a marketing video Frame uploaded to his YouTube channel, titled “Why Empower Network Does Not Work!”, Frame credits himself as a ‘marketing expert with over forty years experience‘ and claims to have had ‘online success since 1998‘. In the past, I’ve built profitable networks in MLM companies… heck I’d even started my own MLM companies online which had done very well. In a blog post titled “Folks who never made a dime online made money this week in Pure Leverage” by founder Joel Therien, Frame was listed on Therien’s “reseller leaderboard” for Pure Leverage for the week 12th to 18th of March 2013. In 2006 Frame launched “Your Cash Cow”. Your Cash Cow was a matrix-based recruitment scheme that charged affiliates $10 to participate. The scheme seems to have collapsed sometime in 2008. Graham Frame has been in business for over 40 years. He has started and successfully built many businesses, both conventional and MLM and has a very comfortable lifestyle that most people envy. He founded Cash4Sure.biz in 1998, a thriving business that is still going strong today. Taking business seriously, he is a member of many organizations. He is an accountant, a salesman and an internationally renowned master hypnotist. His specialty is in clinical hypnosis and his services are usually given free. Seeing an opportunity, he has just launched a new online program. It suits the needs of any person wanting to establish an internet presence with their business. Web hosting demand is going to skyrocket in the coming years and Graham is providing a service which far exceeds what is available for the price. I, too was victimized by Graham Frame. My family invested almost $18,000 in his Cash4Sure program after being promised a certain level of return. Of course nothing ever happened, return-wise. Mr. Frame gravitated from California to Utah, and then left the country and is presently in Italy. He promises to make good on our and other folks’ investment but I feel it will be a long wait. Read on for a full review of the SimpleFastCash MLM business opportunity. SimpleFastCash has no retailable products or services, with affiliates only able to market membership to the company itself. Affiliates pay $5 a month for an ongoing position in the SimpleFastCash compensation plan. Bundled with each position is website hosting, “millionaire mindset training”, onsite advertising, a downline builder “and much more”. 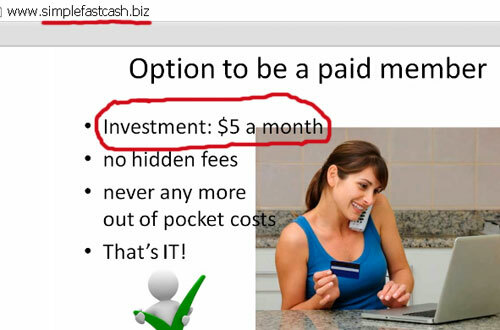 The SimpleFastCash compensation plan revolves around the purchase of affiliate membership for $5 a month. The system uses a simple 1-up style compensation plan to track commissions, requiring all affiliates to pass-up their second affiliate membership sale to the affiliate who recruited them. There are several levels of the SimpleFastCash compensation plan, with the first paying out $4 per affiliate recruited (or passed up by those recruited). The second recruitment commission is passed up. When an affiliate has at least five commissions generated (either via personal recruitment or via pass-ups from those they’ve recruited), SimpleFastCash take $10 out of an affiliates monthly commission and “promotes” then to level 2. The net effect of this (assuming five monthly commissions generated on level 1 is a $1 monthly commission until more affiliates are recruited or passed up in level 1. Level 2 pays out $10 (100%) in the same manner as level 1, with the exception that affiliates cannot be directly recruited into it, they have to qualify for level 2 and be promoted in the manner described above. Like level 1, level 2 uses a 1-up pass-up plan which passes every affiliates second commission to their upline. When an affiliate is generating four commissions in level 2, SimpleFashCash takes out $20 and promotes them to level 3. Step 3 pays out $20 per position filled and once again every affiliates second generated commission is passed up to the affiliate who recruited them. Once an affiliate has four commission generating positions filled in level 3, SimpleFastCash takes out $40 and promotes them to level 4. Level 4 pays out $40 per position, with $80 deducted once an affiliate has four commission generating positions filled. Level 5 pays out $80 per position, with $160 deducted once an affiliate has four commission generating position filled. At level 5 the $160 deducted is used to buy a SimpleFastCash affiliate an Elite Inner Circle affiliate position in Empower Network (which costs $125). Affiliate membership to SimpleFastCash is $5. With the ultimate goal being Inner Circle affiliate membership with Empower Network however, it’s worth noting that this will eventually wind up costing a participant $125 a month. Quite obviously SimpleFastCash has been designed to lure people into Empower Network under the premise of getting others to pay for their Inner Circle affiliate membership. At a bare minimum and taking into account an affiliate’s own $5 contribution, this equates to needing twenty four recruited people to each chip in $5 to make up the $125. In reality the number of people is higher once all the SimpleFastCash passups are accounted for and the affiliates required to push an affiliate’s recruited downline under them through all five levels of the business. If we detach the Empower Network affiliate position awarded at the top of the pay plan, all we’re left with is a recruitment driven scheme that affiliates pay $5 into each month. 100% of the revenue generated in SimpleFastCash is sourced from affiliates and is subsequently paid out based on the direct and indirect recruitment of new affiliates. This puts SimpleFastCash squarely in pyramid scheme territory, as evidenced by the fact that if affiliate recruitment slows down on level 1, anyone trapped in the mid-levels of the scheme loses their money when the scheme stalls. Empower Network is already suspect enough with its questionable compensation plan and near 100% affiliate participation. Does it really need smaller pyramid scheme feeders overlayed ontop of it? Graham Frame seems to think it does. A pyramid to get people in to another pyramid? Crazy.